As Mark Twain said, history does not repeat itself but it rhymes with itself a whole lot of times. I remember the 1997 Asian Crisis, which had been brought about by Pacific Rimmers (plus India) feasting on cheap credit from the Bank of Japan. Dollar and especially yen denominated debt looked like a win-win for everybody: countries with weak banking systems such as South Korea and Indonesia had access to far cheaper credit than they had available before and investors in Japan, Hong Kong, London etc got truly high yielding bonds. I remember around 1995 it was not uncommon for investment grade paper from the Pacific Rim to yield 7-8%. Thailand was the poster child for all of this, especially given it had long been a manufacturing hub for Japanese companies and hence banks such as Sumitomo and Sakura were already well established on the ground. Thailand was also the epicenter of the crisis, when it was forced to float the baht after “discovering” its foreign currency reserves were nowhere near as large as reported. This time, it’s slightly different. Far from being confined to a single continent, dollar and euro-denominated bonds have been issued by governments and corporations all over the globe with abandon. From Brazil to Ukraine, from Petrobras to Fosun International, it has been a mad scramble to take advantage of financial repression in the US and Europe. So far it has been a win-win for all parts involved. A Chinese company issuing euro-denominated bonds can save more than 2% on interest payments even with the PBOC in full panic mode. With the yuan tightly pegged to the dollar, it also means repayment costs in domestic currency terms have gone down considerably in the last year and a half. An European investor gets investment grade bonds yielding around 4%, a mirage in these hard times we live in when Italian sovereign bonds yield half as much as German bonds yielded in 2006. We are daily reassured emerging countries such as Brazil or Indonesia have learned their lessons and now have vast foreign currency reserves with which to defend their own currencies and hence avoid a repetition of the Thai disaster. But those reserves are draining fast and due to the commodity slump are not being rebuilt. Financial markets right now are far larger than they were in 1997: it takes a whole lot of money to defend a currency, one way or the other, as the World’s Largest Hedge Fund (also known as the Banque Nationale Suisse) learned earlier this year. 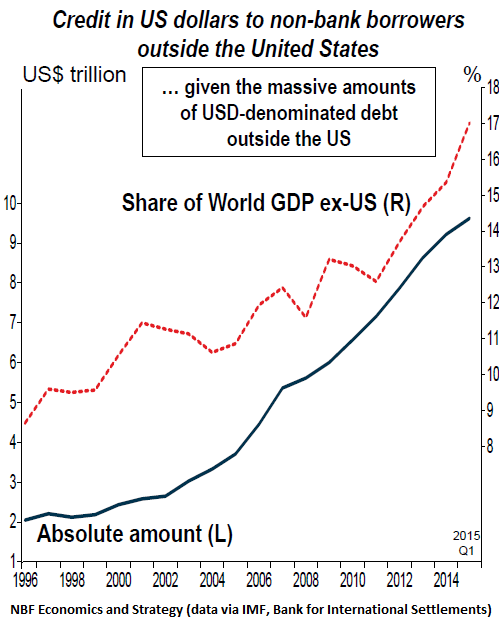 Much more critical, the world is fleeing to the safety of dollar-denominated assets. The pressure on the US dollar is upwards and will probably get even stronger over the next six months, regardless of what the fed will do. For countries such as Brazil and Malaysia, defending their own currencies, and hence the solvency of their own credit systems, will become harder and harder… and this is if things stay the same, if those countries can resist the temptation to pull a Kuroda or play the old and tired Keynesian card. Honestly I don’t believe we’ll be so lucky as to have another 1997 Asian Crisis. I say “lucky” because, as painful as it was, it was over soon and countries such as South Korea could start rebuilding. This thing has the potential to drag itself for years if not a decade. We’ve already seen this in Europe: outside of the German export machine, the whole Continent has been dead in the water since 2009. Shell has predicted the slump in oil prices may last well into 2020. That’s an awfully long time and Shell seems to believe in it, as they are quickly dismantling and auctioning off their European operations to save money. But oil is just a single commodity which is far more reactive than all the others put together except perhaps copper. Iron ore, coal, cotton, palm oil, bauxite, natural gas… unless China doubles down, again, on building empty cities in the middle of nowhere the slump in some commodities may last for a decade. Think about it. This is extremely bad news for countries such as Brazil. It means their precious foreign currency reserves will have to last for an awfully long time with no top ups. ’97 financial crisis the Asian governments literally giving away the sovereignty to IMF was a wake up call. Granted many countries and especially Korea having gone thru debt workouts came out OK but the economy was ravaged for few years. I think another crisis like ’97 won’t be regional but rather global and much bigger scale with China’s hidden mountain of bad debt (for now swept away) by SOE (state owned enterprises) and provincial & local governments on spending binge with astronomical mother of all debt. And if China is the next sick man of Asia (coming on the track of Japan since stock and housing crashed in ’89 – history does repeat) gets sick then peripheral Asian countries will get sick. Add to this PIIGS in EU-land, Latin America, Aussies, etc. Yep lot more sinister than ’97 crisis confined to Asia. I sense the global CB cabal is about to unwind exposing the follies of money printing and lost confidence in the FIAT currencies. Exellent article Wolf! I had read something about this earlier elsewhere but your article explains in much better detail. Thank you. good article wolf. do you agree that it is is a counterpoint to the zerohedge idea that we are watching the “death of the dollar”? maybe you could do a missive in that regard so we can silence (but probably not) the “yuan is the next global reserve currency” blowhards….as if that is going to happen any second now. Just a thought. Gregor MacDonald believes that the US, over the next five years, will go from a net energy importer to a net energy exporter, and, therefore, the USD will remain strong over that five year period. After reading the this post, and the post that preceded it, two things come to mind. One is the Mexican Peso crisis, in which some Mexicans took out home mortgages in US dollars. When the peso tanked, those folks got foreclosed. It was a great time for US citizens to pick up Mexican real estate assets. Even though the peso has weakened again, this time there should be far fewer bargains in the Mexican foreclosure real estate market. However, Americans vacationing in Mexico have got to be enjoying the powerful USD. The other thing this post brought to mind was that period when the Japanese used 100 year mortgages to buy US trophy properties, at super bubble prices. This happened about five years after the Plaza Accord, when the yen got super strong. Those 100 year mortgages did not turn out well for Japanese buyers or the Japanese banks. The Plaza Accord did not turn out well for Japan, itself. On another note, hadn’t realized that PIMCO was holding rotting Century Bonds. Well, PIMCO investors can’t blame Bill Gross for this blunder. 100 year bonds? For a minute I thought this was April Fools day. I had not heard of these. My mom is almost 100. In her approx lifetime: (Funny, no 100 year bond offerings or fools dumb enough to buy them on this list). With all the uncertainty and gamed markets I went cash 5 years ago…and land purchases 8 years ago. I didn’t win the roulette spin but I didn’t lose anything, either. Steady as she goes, matey. Interesting list. The list excludes inventions and technological change other than war facts, nukes, etc. Due to my disbelief about 100 year bonds I looked them up and was amazed to also see 1,000 year options including CP. How do you spell Hubris? Amazing stuff. Some analysts see the demand for this type of long-term bond as an indicator of consumer sentiment for a specific company. After alls, who would buy a 100-year bond from a company they didn’t believe would last? For example, if there was especially high demand for Disney’s 100-year bond, this could mean that many people believe that the company will still be around to pay out the bond in a century. 1,000-year bonds also exist. A few issuers (such as the Canadian Pacific Corporation) have issued such bonds in the past. There have also been instances of bonds issued with no maturity date, meaning that they continue paying coupon payments forever. In the past, the British government has issued bonds called consols, which make coupon payments indefinitely. These types of financial instruments are commonly referred to as perpetuities. “In the past, the British government has issued bonds called consols, which make coupon payments indefinitely. These types of financial instruments are commonly referred to as perpetuities.” It is worth recalling that these consols were based on the pound when England was on the gold standard, and so it was not incredible that they paid “only” 1%*- but what kind of idiot puts his faith in a 100 year bond at 1% backed by paper money? *And when they went off the gold standard in 1931, pure whipped cream turned into dog sh*t. Louis Sullivan in his excellent Prelude to Panic (hard to find) said this was the proximate cause for the Great Depression in America: when it became obvious that we were next, savers began demanding bullion for their dollars (i.e. gold certificates, or literally receipts for gold)- except thanks to fractional reserve banking, they had only $40 in gold for every $100 issued, and the banks failed one by one. I got suckered last Xmas into attending a timeshare pitch in Branson. It was billed by the sales lady at Bass Pro Shop as an introductory vacation deal to encourage customers to consider the company’s resorts. No mention was made by her to marketing timeshares. I first realized I had been bamboozled when I got my bank statement and saw the transaction billed as Timeshares. I tried to cancel but the service rep told me there would be a steep penalty if I did so. It was a good deal if a person was really interested in the product. But I felt like I was benefiting on false pretenses. I talked to several people at the hotel and a pattern emerged. Older people such as myself were sold the vacation promo story, but the younger people knew it was a timeshare pitch but didn’t care because they got a free room and were able to vacation on Bass Pro’s dime. I told the sales rep that I was sorry he had to waste his time, but I had no interest in buying a timeshare or going into debt for any reason. He soldiered on but the wife told him the buyer would only be getting a promise to rent a unit on a discount, and I followed up with the notion that said the discount was only good as long as Bass Pro stayed in business. This rattled him. He could not wrap his mind around a big outfit going bust. We didn’t buy and enjoyed the rest of our long weekend. Selling blue sky and snake oil is back in fashion. 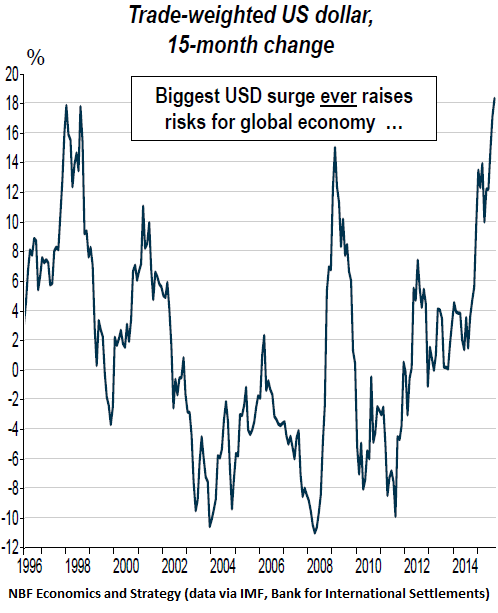 So, even though the Fed has been following an easy money policy, the dollar has been rising anyway because other central banks have been following easier-money policies. This kind of begs the question as to what the Fed is supposed to do now. They can raise rates to a more “normal” level (i.e. above zero), and accept the grotesquely overvalued buck (and resulting grotesque trade deficits). Or they can do what they did, so as to have a somewhat less overvalued dollar, and somewhat smaller trade deficit. It would seem that “normal” is not an option.